A mechanism for tracked vehicles, makes them easier to steer and more effective to drive. In this case we have two differentials, each driven with a separate motor. 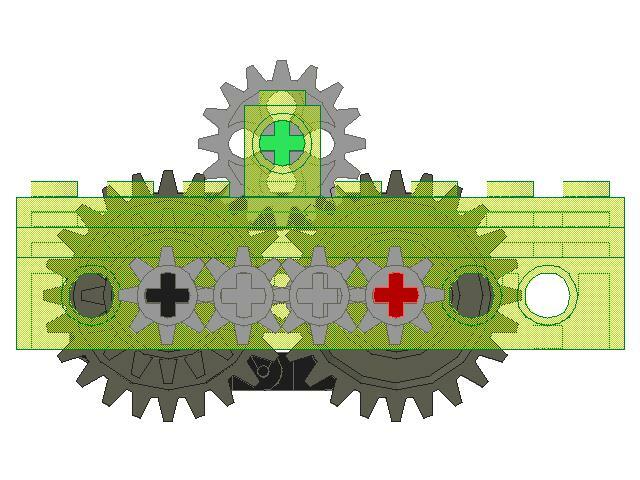 The basic principle is to have the differentials connected by two sets of gears (left and right), that offer different direction of rotation. 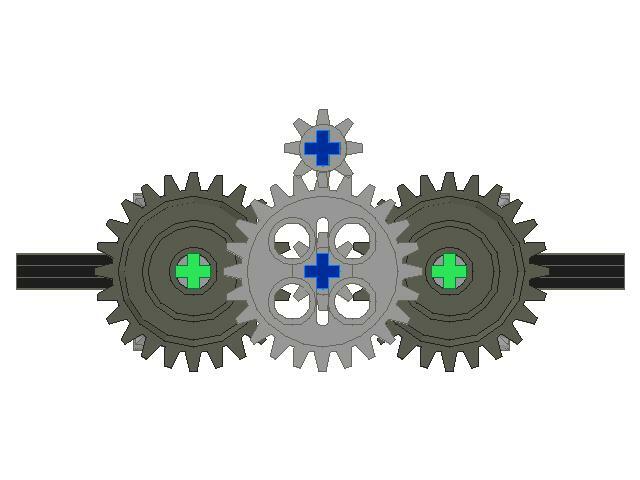 I usually use two t16 gears with a chain on one side and four t8 gears or two t24 gears on the other. Different combinations are obviously possible. Here both differentials transfer drive from a single drive motor. The steering motor makes them rotate in the same direction, which causes one tread to run faster, and the other one to go slower. 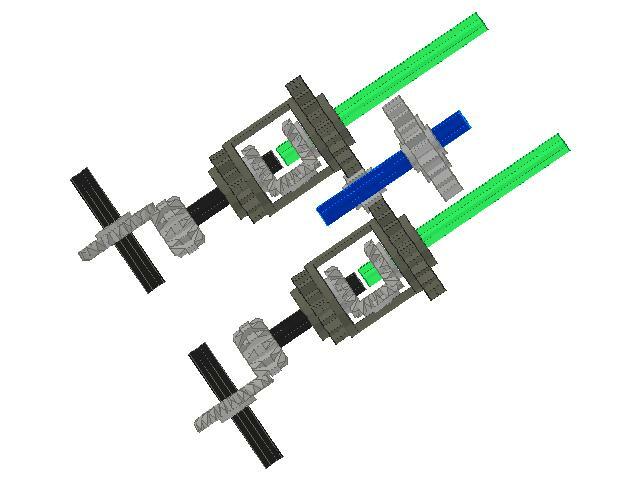 This version is very similar to the one above, except is uses two drive motors. Each of them drives one tread, which is very useful for particularly heavy vehicles. The steering motor, again, makes one tread run faster, and the other one run slower. 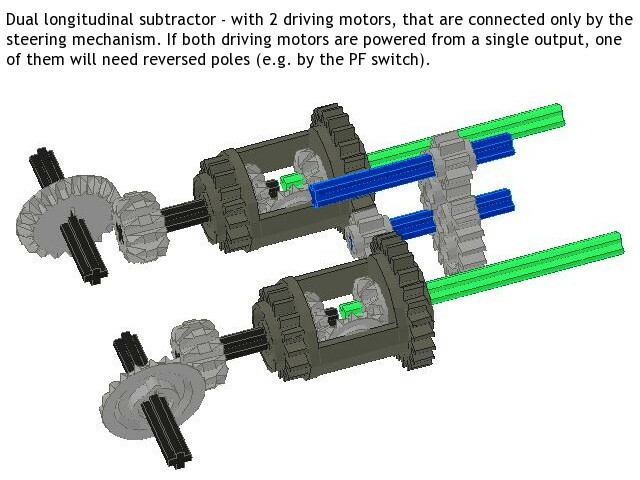 If both motors are powered from the same output, one of them needs reversed poles, which can be obtained via a PF switch. Such switch can be actually used to make the vehicle turn in place if the steering motor lacks torque for that. Sure, you can build subtractor with new differentials, my first book has examples with instructions. As for help, thank you, simply keep watching my YT videos, that will generate some money for me. thanks for the great tutorial. To your knowledge, is there any way to build the subtractor with the new differentials (part no. 62821)? On another note, I read that you’ve had to downsize the instructions to cut domain expenses. What can we users, who benefit of your talent and kindness, do to support you? 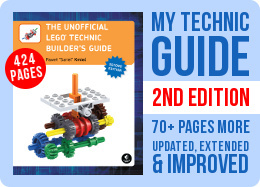 There’s also a smaller version with the new differentials in my first book. Sounds exactly like transverse subtractor. I just thought of a new way of building a subtractor. 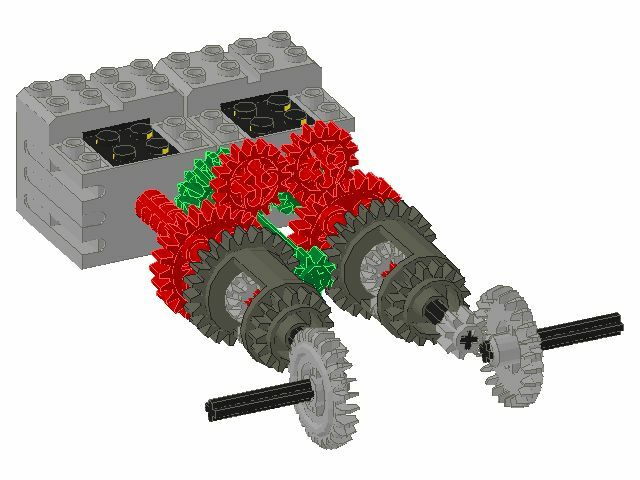 First build a drivetrain as in a car; a motor driving a differential, that drives the tracks. 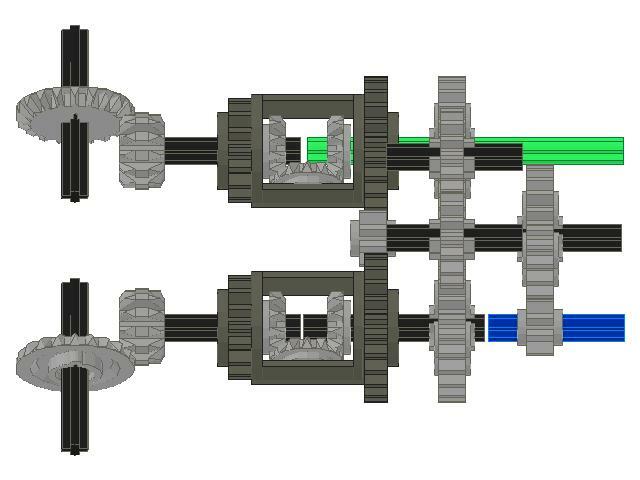 Then add a second diff driven by the steering motor, parallel to the drive diff. Then connect the outputs of both diffs together so, that the direction of rotation is reversed on one side. In this way you’ll use the diffs in a more conventional way, so they should be able to handle more torque. No, I don’t think you can increase it. A lot depends on the weight of the vehicle, I happened to break some gears at 3 kilograms. how much torque can the longitudinal one handle? im using two pf xl on the drive and either a pf xl or pf m on the steering end. is there a way to increase the torque the differentials can handle? No, it’s not possible. And differentials are very cheap. 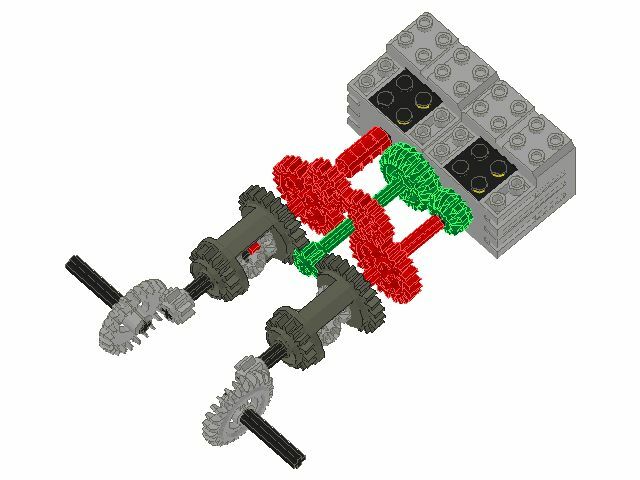 Is it possible to make a subtractor using only one differential? Because I only have 1 differential so I can’t make a subtractor using the tutorials above. If you’re planning to use them with PF IR receivers, then yes, of course. Okay, I plan on purchasing two 71427s and a micromotor, does that mean I’ll also have to purchase PF Extension wires? Doesn’t matter. 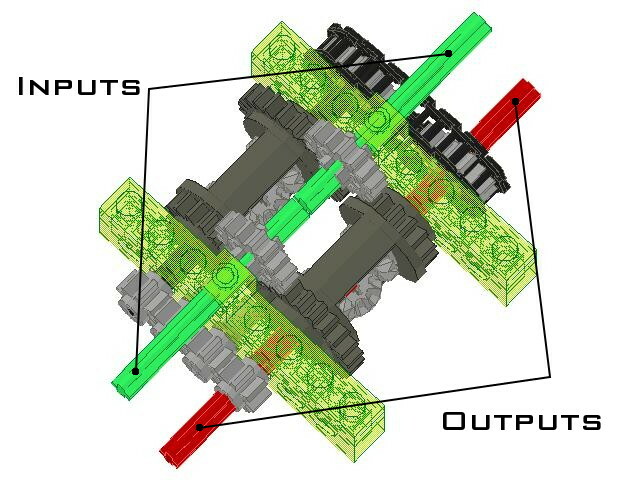 Subtractor works with any motors. 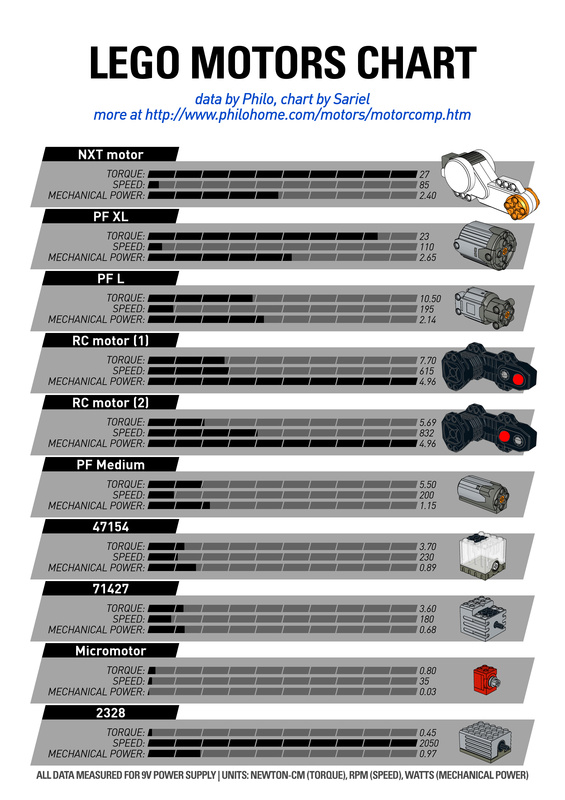 Are you using the old or new motors? I ask because bricklink has both and I’m not sure. Speeds don’t sum. Torque does. It is 1 stud and they will work that way if you make sure the bricks between them stay together. Or, you can replace t24s with t20s and decrease spacing to two plates instead 1 stud. 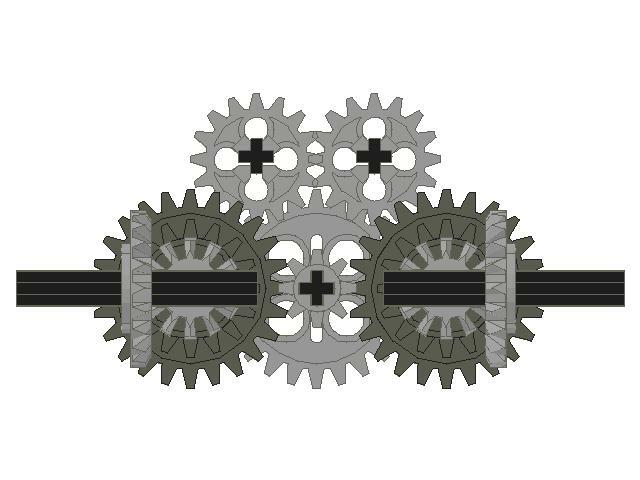 sorry what is the correct spacing between the two 24tooth and the two 16thooth gears, i tried 1 stud, it worked but the gears didn’t look fully meshed? You could knock out this “awesome” thing if you don’t want to be annoying. uhm,not to be annoying but could you maybe make a vid with a better quality. because i dont see very much. Gear 24t between differentials means no gear reduction (I assume you drive the 24-teeth side of the differentials). You could try replacing that 24t gear with three 8t gears (two of them as idlers). That would generate some backlash, but you would have 3:1 gear reduction and your steering motor would require three times lower torque to work. By a fortunate mistake, I now have only gear 24 between differentials and that is connected directly to steering motor. My creation works fine with both remote controllers. But still I’m not happy about using steering motor when drive motors are off. My creation is going to be used by children, so it would be good to have some protection to the steering motor in those cases..
Any ideas? Somekind of power cut-off? Yes, I understand these difficulties with the controller. It doesn’t work like the analogue controllers common among RC models, it’s much less intuitive. Perhaps the problem is that this controlled was designed with Lego Trains in mind, and it’s not really suited for different tasks. That solution has the problem I was taking about. I tested it and it jumped steps all the time. I made it little more robust, but it didn’t help. But I think it does work, if you use it with patience. But bigger problem is the controllers unlimited dial steps. At least with a remote design like yours, combined speed dial controls. But like I said, no problems like those when using subtractor! And with simpler controller, just two wheels. Left wheel (speed) tilted to the side. You mean a solution like that one: http://sariel.pl/2009/04/8879-power-functions-speed-control-remote-modified/ ? I think I got it to work now. Steering is fast, I could be even faster (maybe with gear 40 ;), because when my vehicle it’s ready, I’m gonna use it with the new 8879 remote control and turn arch can be controlled with those dial’s speed levels. 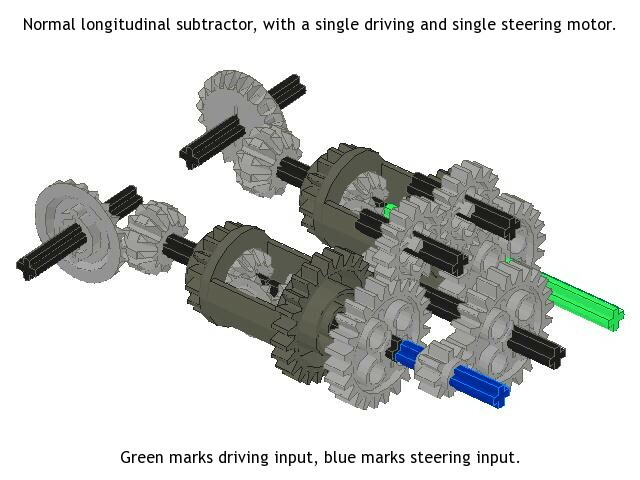 Without subtractor steering tracked vehicle is hard with 8879 because the dials unlimited rotation. It’s easy to loose the syncronizing between those two dials. It does work better with slow “turns”/changes, but that’s boring. You need a greater gear reduction for the steering motor. 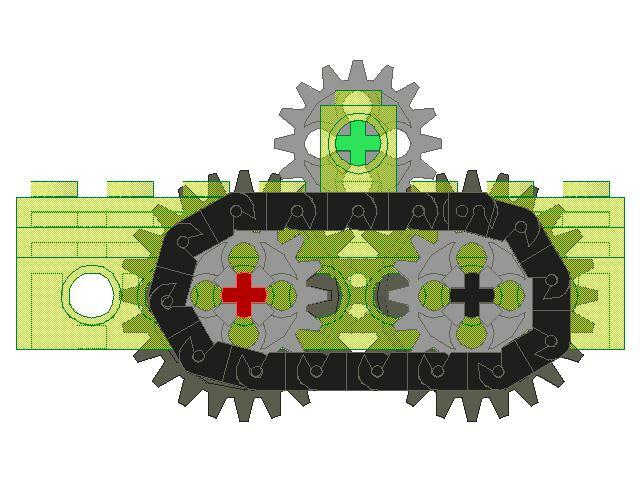 Clutch is useless in subtractor, because you don’t usually need a clutch to steer a tracked vehicle. What happens on (working) subtractors when swithing steering motor on and drive motor(s) are off? I’m testing dual longitudinal subtractor with PF XL motors to drive and medium to steer. I seems when using steering motor and drive motors are off, the steering motor is on heavy strain. It does not have power to move anything (my prototype is very light weight). That strain is not a good thing.. I have gear 24 between differentials and two 16 before steering motor, are that the reason for my problem? I had to replace gear 8 with 24 because XL motors doesn’t fit on the original drawing. Maybe I just have to add a clutch after the steering motor…? But when drive motors are on, steering works like a dream. I prefer double bevel gears in there. For instance the 12-teeth one and 20-teeth one. 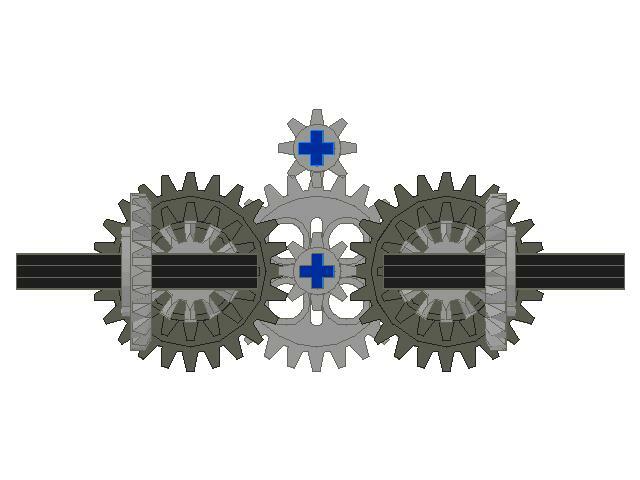 You may consider knob gears for extremely heavy duty. was playing around with this the other day to use in a model. 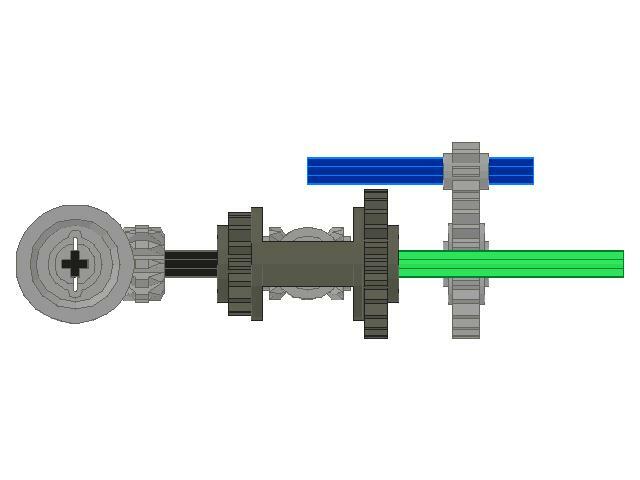 but was wondering what size gears you used to transfer power between the motor drive shaft and the secondary drive shaft in the single longitudinal version. 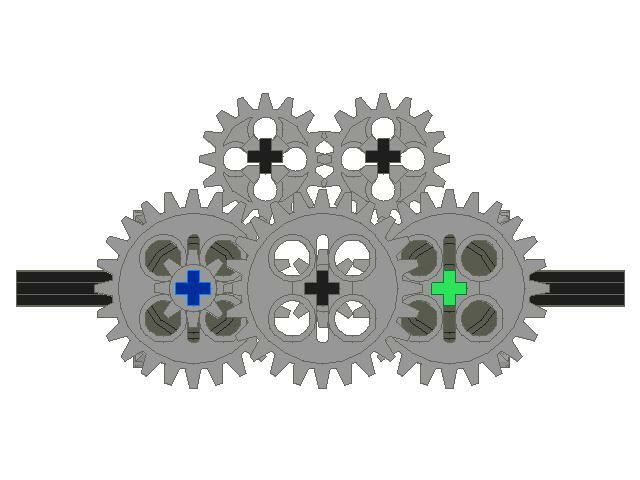 i believe i tried the two sizes of gears shown in the pic but found that i could only get them to mesh with considerable backlash? am i using the wrong size gears? I developed this gear some years ago (2006 or so). But in my experience the diff-gears are broken several times.